If ever there was evidence that getting a film made is more about who you know than what you can do, A Happening of Monumental Proportions would be exhibit A. Filled to the brim with recognizable and name actors, mostly an assembly line of glorified cameos, one can’t help but wonder what they are all doing in a film with such an unimpressive script. The answer comes with the realization that this unfocused ensemble comedy is the directorial debut of character actor Judy Greer. Greer has had an impressive career as a supporting actress, which is undoubtedly how she was able to get so many fellow actors to commit to being in the first screenplay by Gary Lundy (another working actor) that fails at every turn. The biggest problem with this film may actually be the biggest selling point. With as many name actors as Greer has convinced to be involved, she also has to find a way to utilize them all. Unfortunately, rather than feeling like an ensemble narrative, it just feels like a movie that doesn’t have any direction. Things happen and characters interact with each other, but often there is nothing but proximity to connect all of the narrative threads together. By the time the credits roll, one can’t help but wonder what the point was beyond giving a handful of actors work between real jobs. The location eventually tying all of the stories together is a public elementary school in Los Angeles. When two school administrators (Allison Janney and Rob Riggle) arrive at the school on career day, they are shocked to discover the school groundskeeper deceased in front of the entrance. With no official figures available to quickly remove the body (easily the stupidest of the script’s plot contrivances), they decide to move it into the teacher’s lounge. This is the closest thing the film has to a central storyline, but most of the characters are made up of teachers that never seem to be in class. These teachers include Mr. McRow (Anders Holm), a tired cliché as the teacher having an identity crisis that he openly shares with his students, along with his colleague Mr. Ramirez (John Cho). You might think that they would have scenes interacting with the administrators and the dead body, but the characters and their individual storylines mostly stay separate, and it isn’t difficult to imagine that most of these actors were never even on set at the same time. The students get in on the storyline, at least the ones that help connect unrelated adults to the story. Storm Reid (A Wrinkle in Time) has an unfortunate storyline involving the well-meaning but creepy advances of a fellow student with a crush, but her real purpose seems to simply provide a reason to connect her father, Daniel (played by Common) to the storyline. Before arriving to his daughter’s school for Career Day, Daniel has quite the morning. He arrives to work to find that a new corporate suit (Bradley Whitford) has been hired to shake things up. When an incident involving a coffee machine has the office under scrutiny, it comes out that Daniel is having an affair with his married co-worker (Jennifer Garner), and he is fired. As coincidence would have it, Daniel finds himself at Career Day right beside the man that just fired him. If none of this sounds particularly funny, that’s because it isn’t. The characters are poorly developed, which wouldn’t matter if they were at least funny. I imagine Greer planned to improve the script with the performances by the talented cast, but that clearly did not happen. Even funny actors are hardly amusing in this film, and those who don’t excel at humor are horribly out of place here (most notably Katie Holmes as an EMT). Not even the arrival of Keanu Reeves playing against type can’t squeeze a laugh out of this screenplay. The DVD special features only include a promotional featurette. 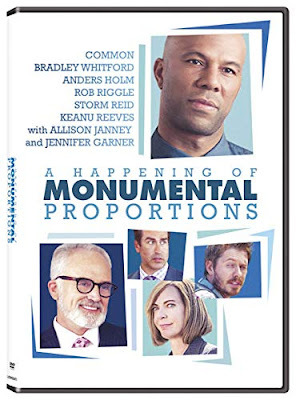 It is titled “A Sneak Peek at A Happening of Monumental Proportions,” which is not exactly something anyone would need when they can just watch the film. When it comes to security 2 factor authentication gives an extra advantage to Blockchain users. Is your Blockchain 2fa status still pending? Do you want to get rid of this problem? If yes, then dial Blockchain toll free number to avail best in class services of an elite representative at Blockchain. They are pro-active and give you appropriate solutions for all your problems. Help yourself by availing their services.